The Riparian Ecosystem Restoration in Tropical Agriculture (RERTA) Project will start in August 2016. 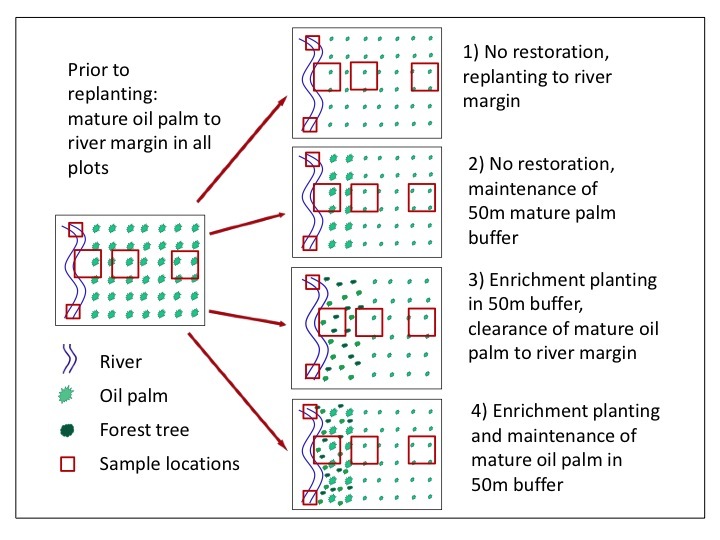 This will experimentally assess the potential for restoring forest in riparian margins in established oil palm plantations during the replanting process. All sampling will be carried out at three different distances from the river: (i) within the riparian margin (immediately adjacent to the river), (ii) adjacent to the riparian margin (50m from the river), and (iii) deep within the oil palm landscape (>500m from the river). We will also establish monitoring plots to sample aquatic ecosystems in the river itself, both upstream and downstream of the restoration area, so effects of the treatments on river conditions can be assessed. 4) Enrichment planting and maintenance of mature oil palm in 50m buffer. Schematic diagram of the experimental set-up. Each treatment will be replicated six times across the plantation landscape on rivers over 5 metres wide.